Andria Zafirakou has been praised for working with disadvantaged pupils and their families. A teacher from north London has been announced as winner of a competition to find the world's best teacher. 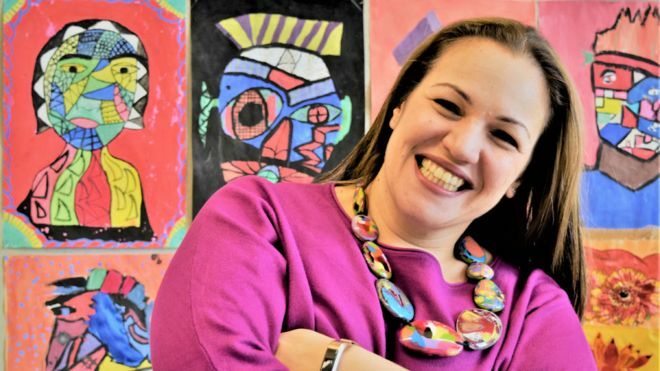 Andria Zafirakou, who teaches art and textiles in a Brent secondary school, has won a prize worth $1m (£720,000). She has spoken of the hardship and overcrowded housing conditions facing many of her pupils. But in accepting the prize, she called for more support for the "power of the arts" in school, particularly for the "poorest communities". Mrs Zafirakou becomes the first UK winner of the Global Teacher Prize, beating teachers nominated from more than 170 countries. The prize, launched in 2015 by an education charity, the Varkey Foundation, was created to give more status to the teaching profession, with an Oscars-style awards ceremony in Dubai. The London teacher was congratulated by other finalists. Prime Minister Theresa May sent a video message commending Mrs Zafirakou and said great teachers needed "resilience, ingenuity and a generous heart". Racing driver Lewis Hamilton, Olympic champion Mo Farah, former US vice president Al Gore and former UK prime minister Tony Blair were part of the event honouring the north London teacher. In her acceptance speech, she said schools should be "safe havens" and called for greater recognition for the value of arts subjects in school. She warned of "deprivation" and "tough lives" where "children may not eat well because their lunch boxes are empty". But she said school could make a great positive difference - particular through creative subjects. "Too often we neglect this power of the arts to actually transform lives, particularly in the poorest communities." The teacher from Alperton Community School has been praised for her work with the local community as well as with pupils. She says the mix of people and languages in this part of north London is a "beautiful challenge" which creates a "buzzing" atmosphere. Andria Zafirakou called for more recognition for the value of the arts and creativity in school. It is claimed as one of the most ethnically diverse places in the UK, with 130 different languages spoken in the London borough. She has learned basic phrases in languages such as Hindi, Tamil and Gujarati and has visited homes to build links with the school. Mrs Zafirakou has been praised for making her pupils feel secure, working with the police to make sure they travel to and from school in safety. And she will have to stay in teaching, because a condition of the prize is remaining as a teacher for at least the next five years. Education Secretary Damian Hinds sent a message to say her "story of selflessness and dedication is truly inspiring". Head teachers' leader Geoff Barton said the award "reminds us all of the power of great teachers, the importance of creative subjects, and demonstrates the world class standard of UK education". When she reached the top 10 shortlist, she spoke of the disadvantages facing many of her pupils. "By getting pupils to open up about their home lives, I discovered that many of my students come from crowded homes where multiple families share a single property," said Mrs Zafirakou. "It's often so crowded and noisy I've had students tell me they have to do their homework in the bathroom, just to grab a few moments alone so they can concentrate." In response, she organised extra lessons during the day and the weekend, including giving pupils a quiet place to work. The nominations from Andria's school said: "I am submitting a nomination for a teacher who is a true gem, one who inspires such possibility and potential in her students, their parents, the staff, her peers, the local community, and future teachers and leaders." "A phenomenal teacher and leader. She is guided by a moral compass that underpins a passionate desire to give every student at her school the world - no ceilings, no limitations, no boundaries." "She is a force to be reckoned with when it comes to ensuring that students deserve the best education possible." "One lady with care and passion can make a huge difference to the lives of many. She is upbeat, full of character, highly regarded and I wish all schools were blessed with a senior leader such as her!" The finalists were drawn from more than 30,000 nominations in 173 countries. Sunny Varkey, founder of the Varkey Foundation which runs the competition, said he hoped "Andria's story will inspire those looking to enter the teaching profession and shine a powerful spotlight on the incredible work teachers do all over the world every day". •Barbara Anna Zielonka, English teacher, Nannestad, Norway.